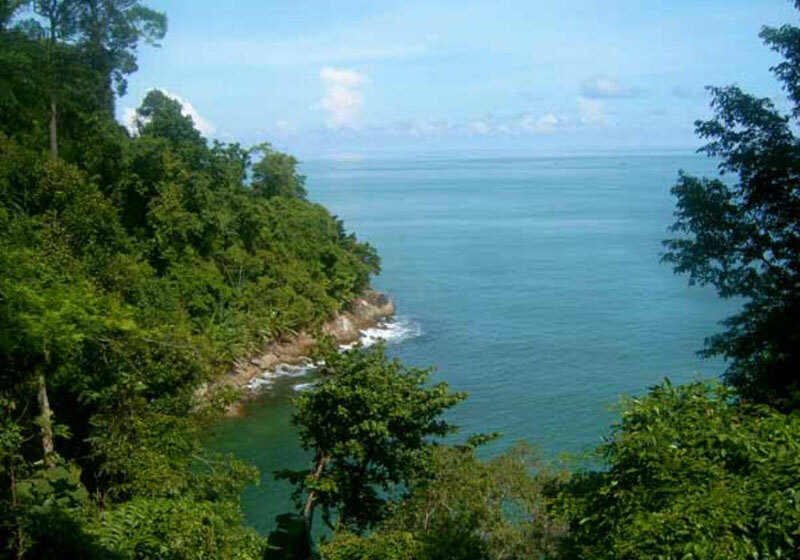 Khao Lak Lam Ru National Park is located 33 kilometres. from Amphoe Takua Pa at Km. 56-57 on the left of Highway No. 4. It was established as a national park in August 1991 and covers a total area of 78,125 rai in Amphoe Takua Pa, Amphoe Thai Mueang, Amphoe Kapong, and Amphoe Mueang Phang-nga. The Khao Lak Lam Ru National Park features undulating mountains including Khao Lak, Khao Saeng Thong, Khao Mai Kaeo, and Khao Plai Bang To. The mountains are covered with evergreen forests where several species of flora can be found such as Yang – Dipterocarpus alatus, Phayom – Shorea roxburghii, Malacca teak, Bunnak – Mesua ferria, Takhian Thong – Hopea odorata, Krabak – Anisoptera costata, etc. The highest mountaintop is about 1,077 metres above sea level and is the watershed of the province’s major rivers including the Phang Nga and Takua Pa. Frequented fauna are Malayan tapir, tiger, Sumatran serow, monkey, langur, deer, barking deer, great argus pheasant, hornbill, woodpecker, bulbul, and hill myna. There are 5-kilometres and 7-kilometres Namtok Ton Chong Fa Nature Trails, taking about 2 and 5 hours, respectively. There are nature interpretation signs along the steep routes. A guide is needed. Short Description: Khao Lak–Lam Ru National Park is a national park in Phang Nga Province, Thailand. The park is named for two of its mountain peaks, Khao Lak and Lam Ru. It also encompasses beaches and forests.